Kira, a thirteen-year-old girl, is physically flawed and has recently lost her mother due to an illness. She is talented at weaving and making beautiful designs out of thread. After spending time with her mother’s spirit, an argument with Vandara and some of the women over her living space causes Kira and Vandara go to the Council of Guardians to settle their dispute. She has a defender named Jamison during her trial. The council decides that Kira will have a special job, to repair the Singer’s robe and live inside a special building, while Vandara can have Kira’s old living space to build a pen. Kira has to travel through the woods to learn from an old woman named Annabella. Annabella soon dies and Kira is left to learn on her own. Through tedious, careful, skillful work, Kira completes and restores the Singer’s robe. Thomas, a talented woodworker lives next to Kira and they became good friends. They discover a young girl named Jo who can beautifully sing living near them. Soon, the day of the Gathering arrives and Kira listens to the Song sung by the Singer who is wearing the robe that Kira had meticulously worked on. Later, her friend Matt shows her how to make blue dyes and tells her about a far-away village where “broken” people live. Kira learns more about her society and how to improve it after her conversation with Matt. 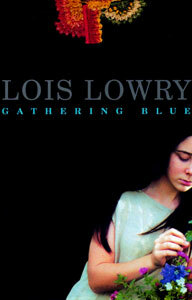 Overall, I thought Gathering Blue was a great book. When I first opened the book, I noticed that the author used many strong vocabulary words and varied sentence structure to make the story delightful to read. She was able to make the futuristic world of Kira come alive and supplied lots of details. In addition, the author explores various themes of friendship, courage, and honesty that enhance the book. I enjoyed how the author gradually builds on Kira’s character as the story progresses. It was also interesting how the author portrayed different characters through their dialect. The powerful people spoke with strong vocabulary and people who were poor spoke with incorrect grammar and slang. Through the vivid vocabulary, riveting plot, and use of literary devices, I was completely absorbed into the story and I could not stop reading it. I would highly recommend this book to people of twelve to fourteen years of age and give Gathering Blue nine out of ten stars. 1. What happened to Kira’s parents? 1a. Kira’s father, Christopher, died before she was born in the great hunt. Kira’s mother recently died from an illness. 2. What disabilities was Kira born with? 2a. Kira was born with a crippled leg. However, her upper body was strong and she was talented at weaving. 3. Why do the women, led by Vandara, want to feed Kira to the beasts? 3a. The women want to build a pen for their animals and tykes in Kira’s living space. 4. What happened at Kira’s trial with the Council of Guardians? 4a. During the trial, Vandara, the accuser, got Kira’s living space and Kira was allowed to live inside a special building where she would repair the Singer’s robe. 5a. Thomas lives next door to Kira and he is a talented woodcarver. 6a. Annabella was an old lady who taught Kira about dyes. 7a. Jo is a young girl who is talented at singing. Kira and Thomas find her crying downstairs. 8. What happens during the preparation for the hunt? 8a. Kira finds Matt in the middle of the men and rescues him. She also learns about the preparation rituals. 9. What is Kira’s role? 9a. Kira is supposed to repair the singers robe, she learns about the past while working on it. 10. What happens to Annabella? 10a. Annabella dies leaving Kira to learn about the dyes herself. 11. What was the Gathering? 11a. The Gathering takes place in the center of the village. Everybody attends the Gathering. The Singer sings a song that goes on for hours about the history of the People. 12. What did Kira notice about the Singer? 12a. Kira realized that the odd sound she heard came from a chain around the Singer’s feet. She finds out that there is a lot of fresh blood on his feet. Kira concludes that the Guardians chain the singer and his talents. 13. What is Matt’s gift to Kira? 14. What was the truth about Christopher? 14a. Christopher is still alive and he confirmed that there were no beasts in the forest. He tells Kira the Jamison intended to kill him but he survived, even though he went blind. 15. What is the other village that Christopher and Matt mention? 15a. The other village is a village where people who were left to die go. When Christopher was injured, some people from the other village came and rescued him.